The Austin Area Society of Hospital Pharmacists (AASHP) was established in the early 1980's when Jim Smeeding and Julie Nelson realized the Austin area needed its own chapter. Prior to AASHP being established, they traveled to San Antonio to attend the local San Antonio chapter meetings. 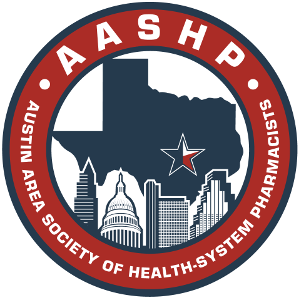 The Austin chapter's original name was changed in 1995 to the Austin Area Society of Health-System Pharmacists. ​Another quarterly report in the mid-'80s reported on a social meeting at a member's house with the following agenda items: barbecue, beer, and volleyball. Of course, more serious items were reported including membership numbers and topics of educational programs held.